Robinvale lies on the Murray River in the North West corner of Victoria, 470 km from Melbourne. It is a hot, low rainfall area (around 300mm annually) made productive by irrigation from the Murray River. 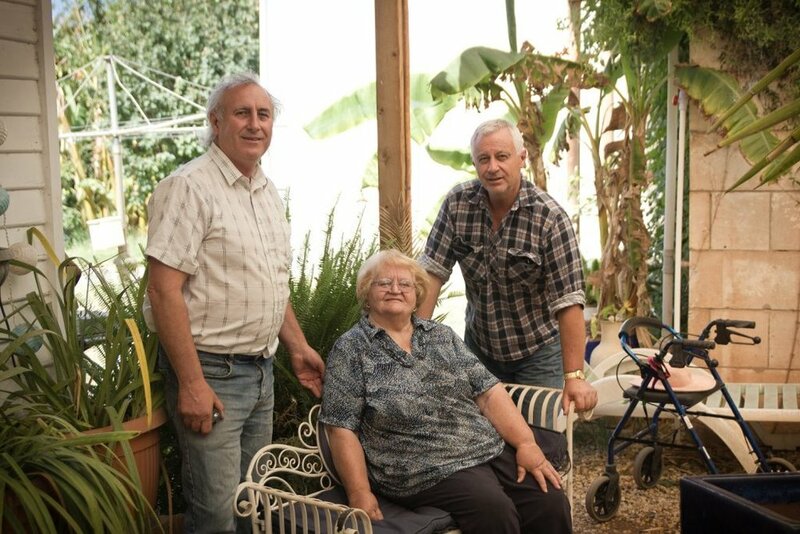 George and Stavroula Caracatsanoudis farmed in Greece before migrating to Australia in 1954. They settled in Melbourne, but travelled around picking fruit at various times. They got to know the Robinvale area while picking grapes, and bought a 16 hectare (40 acre) soldier settlement vineyard in the early 1970s. They later bought two neighbouring blocks, bringing their total holding to 30ha (75acres). Sons Steve and Bill worked with their parents on the vineyard. At times it was difficult to market the grapes and the family decided to go into grape juice, and later wine, with the help of a German food technologist friend. Lynton Greenwood, a Biodynamic orchardist, found their grape juice in Melbourne and paid them a visit. They became friends, and the family began processing his apples and pears into juice around 1980. Lynton introduced them to Biodynamics, and they converted soon after, under the guidance of Lynton and Alex Podolinsky. They were attracted to Biodynamics for health and environmental reasons, both as growers and for the benefit of consumers. Steve says it was something that was there waiting to be woken up, and Lynton was the catalyst. They were granted Demeter-in-conversion status after one year and, approximately four years later became fully certified Demeter Biodynamic. The family is very conscious of the health of their environment, particularly of the Murray River. Chemical pesticides, fungicides and herbicides find their way into the river system together with water soluble fertilizer run-off. This, combined with the salt problem, puts pressure on the river and contaminates water for downstream users. Biodynamics, with no chemical or soluble fertiliser runoff, is a very important counter measure to these problems. When their parents retired, Steve and Bill took over the running of the vineyard and winery, employing with up to ten workers and additional pickers to take the crop off. Steve grows the grapes and Bill made the juices and wines up until his recent retirement from the enterprise. 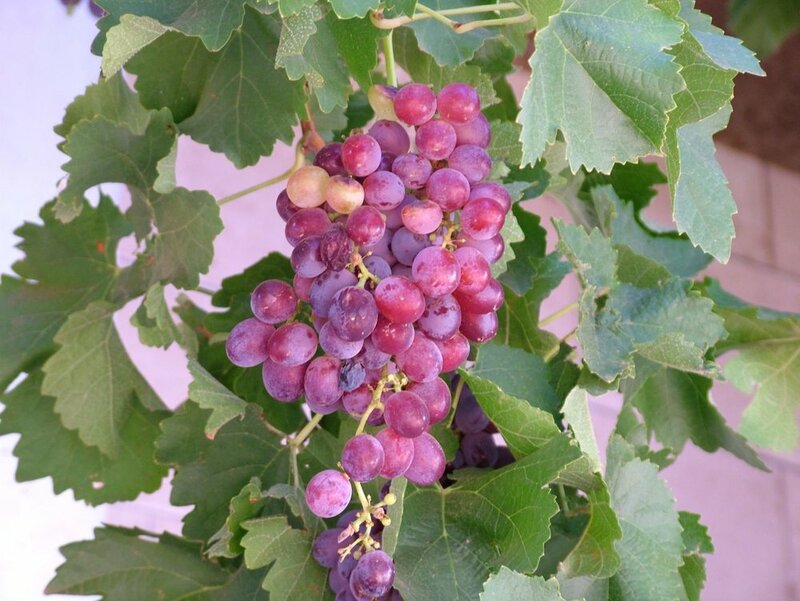 Varieties grown include table grapes Sultanas, Gordos, Ruby Seedless and Crimson Seedless, and wine grapes Chardonnay, Shiraz, Sauvignon Blanc, Zinfandel, Merlot and Cabernet Sauvignon. Sultana grapes and Gordos are dried to make sultanas and muscatelles. Fundamental to growing Biodynamic grapes is to achieve maximum humus development for the plants to function properly. Production is usually based on sheet composted cover crops sown in early autumn, and worked into the soil in late winter. The soil, a sandy loam with some clay, is disced in early autumn and sown with clover (snail medic is very good here) and vetch, legumes that fix nitrogen in the soil. Steve aims to have all grapes harvested, and all green manures sown by the end of April. The green manure may be fertilised with a little guano or composted fish and kelp. The kelp helps with some trace element deficiencies common in the area. Prepared 500 is sprayed (with a quad bike and single fan nozzle) after sowing. The crop is allowed to grow until late winter, by which time it has produced seed, which is important for some natural re-seeding. In late winter, for maximum humus development, the green manure is worked in with discs, or shallowly rotary hoed. The rotary hoe is not ideal, but the crop has to be chopped into small pieces and the soil worked fairly fine so that it can be well consolidated for frost protection. Rough, cloddy soil won’t consolidate, and daytime warmth is radiated too quickly. When the soil is worked fine and consolidated, it draws in and holds warmth and radiates it slowly at night, providing frost protection for the vines in spring. Ideally, Steve would like to install frost fans throughout the vineyard – the soil would then not have to be worked so fine, or consolidated. However, frost fans would cost around $100,000 for the whole vineyard! In summer, another cover crop is grown in every second row – this is for the tractors to drive on, to minimise compaction. This is mainly a mixture of self sown seed from previous years including love grass and white clover. Some years, instead of working in all the green manures and re-sowing every second row, every second row is left, slashed short and retained for tractor access. Soil is mounded a little under the vine but the inter-row space is left flat. 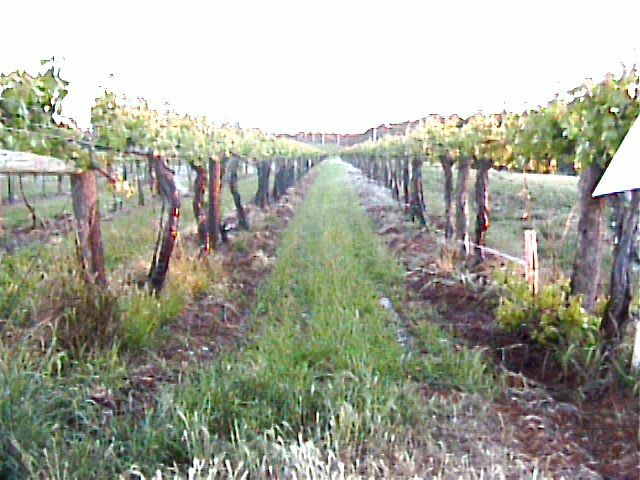 Grass and weeds are controlled under the vines, mainly because they interfere with the under-vine sprinklers. Mechanical weeding is used as well as hand chipping around sprinklers. A certain amount of hand work is also needed to remove a problem prickle weed, Tribulus terrestris. Prepared 500 is sprayed again after working in the green manure. As the organic matter is converted into humus, the vines start growing and feeding from the humus. In the early years, the vineyard was furrow irrigated, but this did not provide general moisture for green manure crops, so under-vine sprinklers were installed in every second row, to cover the whole area. Low growing vines such as Gordo are irrigated by over-vine sprinklers. A variety of pruning systems is used depending on the variety. Some varieties are spur pruned, some cane rolled. The number of wires varies from one to four – more wires are needed to hold the canopy up in varieties that are more susceptible to mildew, or need more light. Red grape varieties develop a deeper colour with more light exposure, an important feature for wine making. But it is a balancing act – more light can also mean more heat in this warm climate and lead to heat damage. Farming is a very creative profession. The farmer has to be constantly aware of a myriad of factors in making decisions. Seasons vary considerably and the farmer has to be aware of the plants’ needs at all times. Steve has been a vigneron for 47 years at Robinvale and has developed a certain amount of perceptual instinct for the needs of the vines - he would find it hard to explain some management decisions to others. Sometimes though, decisions are made by learning from past mistakes (preferably someone else’s!). Seasonal variations include moisture levels, and stress induced by heat or cold. Cold stress causes slower development of the vine. Heat stress (temperatures can reach 42 C) is one of the major problems in the area. It can inhibit the growth of the canopy, and when another hot spell arrives later, the vine is less able to cope. Steve sprays 501 (with an overhead mister) when vines are growing sluggishly, whether because of heat or cold stress. It may also be of assistance with powdery mildew, though more research is needed here. He sometimes uses 501 to enhance flavour in the grapes. BD growers have to learn to use the preparations at the right time according to nature. White plastic covers are used on top of the canopy in Sultana grapes when they are ripe, to prevent rain damage – the grapes can hang on the vine for up to four weeks in a ripe state, before harvest. Many conventional growers cover their Sultana grapes early in the season and then spray herbicides, pesticides and fungicides directly underneath. This can cause problems with humidity, and chemicals rising into the canopy of the vines. The two main disease concerns with grapes are downy mildew and powdery mildew. Downy mildew can appear when 10mm of rain falls in a 24 hour period, and the temperature is greater than 10 C. Once established, secondary infection can develop when warm, humid conditions have been present at night. Steve has tried a variety of approaches to downy mildew including 501, casuarina tea and sodium silicate, and research is ongoing to refine these methods, and they only work when used almost before the disease appears. Sulphur in a dry or liquid form can be used, but is problematic as it is a known trigger for asthma, and workers need protection in the form of a cab tractor with chemical filters. Copper hydroxide is sometimes needed to help control an outbreak of downy mildew. Powdery mildew can occur without rain but can be humidity related. It can occur at temperatures between 15-32 C. Varieties vary considerably in their susceptibility. For instance, in general, white wine grapes are more susceptible to powdery mildew than red wine grapes. Powdery mildew can be treated with milk or with sulphur. As with downy mildew, prevention with 501, casuarina or sodium silicate are possibilities, but more research is needed. The only pests that have to be considered are snails that block up the irrigators, earwigs and grubs that sometimes come on the grapes – the grubs are sprayed with Dipel (bacillus thuringiensis) if necessary. Steve is researching “peppering” for earwigs (burning earwigs and spreading the ash at particular times). Pickers are difficult to find, despite a local unemployment problem, so where possible, grapes are machine harvested (they have their own machine). Some varieties still require hand picking, particularly the table grapes. Approximately 20% of the grapes are machine harvested. The winery is built in Mt Gambier stone which maintains a cool environment. Bill was the juice and wine maker until recently making the decision to step down. Robinvale Wines makes about twenty different juices and wines, including some that are preservative free – Bill developed the technique for preservative free wine himself. Robinvale juices have the most exquisite flavours. They range from straight red and white grape juice to an imaginative array of sparkling grape juice blends – Muscat, Passion, Lambrusco, Ginger, Strawberry, Cooler and Mango. Their wines have won many awards over the years. Many are suitable for vegetarians or vegans. Interestingly, many people who can’t tolerate conventional wines have reported no ill effects at all from Robinvale wines, even those with preservatives. They thought it was the preservatives that were causing the problem, but it may in fact have been the way the grapes are grown. Sultana and Gordo grapes are sun-dried on open air racks to make sultanas and muscatelles. When they reach a certain stage in the drying process, plastic sheets are wrapped around the racks to increase the temperature and speed up the process. Towards the end, dehydrators are put in to finish them off – these send LPG gas heated air through the sultanas. Finally, the sultanas and muscatelles are shaken off the bunches, and packaged in cellophane packs. Growing the grapes and making the juices and wines is only part of the story. Marketing the diverse production from a 75 acre vineyard can be quite a challenge. Most of the product is distributed in Australia, but some is also exported to the United Kingdom and Japan. Steve and Bill have over the years fostered growers who wanted to convert to organic methods as a first step towards Biodynamics. They process a certain amount of organic certified wines and juices and try to help with marketing. Most people experience a dip in yield during the conversion process, and if you are also having trouble selling the product due to the world glut in wine production, it can be a very difficult time. The Caracatsanoudis family are producing the most luscious, health engendering grapes, wines and juices, with no synthetic chemical sprays or soluble fertilizers. Their vines have a real living quality to them. Water that runs off their vineyard has no chemical residues or soluble nutrients to damage the environment. They care for the soil and for their total environment. They care for their workers, who are privileged to be able to work in a safe, clean environment. They care for their farming colleagues who have to use Murray River water downstream. And they care for the thousands ofconsumers who enjoy the luscious flavour and health-giving qualities of their produce.